Salsarita's Menu - Explore Our Fresh Mexican Menu! | Mexican Done Right. Right Here. An Entire Menu Full Of Fresh Mexican Food. Made Fresh, All Day, Every Day. 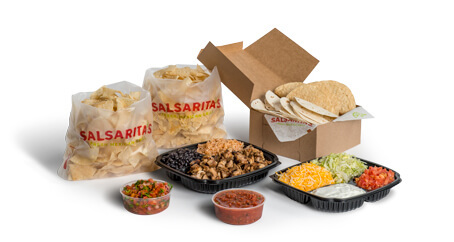 At Salsarita’s, you’ll find the superior taste of fresh Mexican food. House-made salsas that are so good salsa’s in our name. Hand-mashed guacamole. The choicest meats, slow-marinated and flame grilled. And, of course, our wildly addictive tortilla chips. All made fresh, all day. That’s the Salsarita’s way. Your choice of soft or crispy tortillas stuffed with your favorite meat and toppings. Soft tortilla packed with your choice of meat and toppings. Lose the tortilla, and fill up a bowl with your favorite burrito ingredients. A quesadilla takes all your favorite fillings and lovingly heats them with cheese in a folded soft tortilla. We smother our wildly addictive tortilla chips in creamy queso and pile it high with your choice of fresh toppings and meat. It’s everyone’s favorite--a burrito stuffed with your favorite fillings and covered with Salsarita’s creamy queso. Start with a crunchy taco shell filled with Romaine lettuce and pile on your favorite, fresh ingredients. Ditch the shell for a healthier meal! Kids can choose from a single taco, a quesadilla, or nachos. All items come with a drink and a dessert. Stuff it. Top it. Make it your own. Topping options may vary slightly by location. Fiesta Packs come loaded with everything you need to feed up to 5. Comes with everything above, plus our creamy queso, hand-mashed guacamole, and dessert!